KELIMUTU THREE COLORED CRATER LAKES. 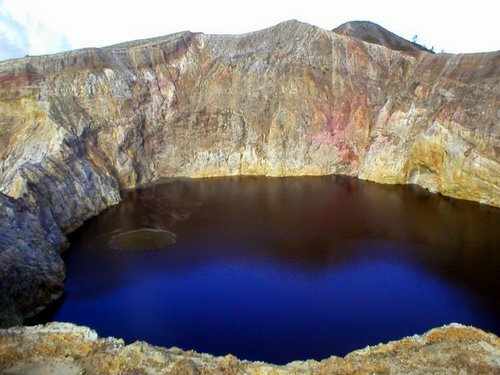 Drive, trekking and walking following Trans Flores highway and off road to villages through spectacular south coastline and mountain panorama, witnessing the three colored crater lakes and So Much More…. Day 1: MAUMERE ARRIVAL - DETUSOKO (-/ L/ D). Up on arrival at Fran Seda airport of Maumere - Flores Island, our local guide will meet you then transfer to Bunaken restaurant at harbor for lunch. Depart to Detusoko. The journey to Detusoko is 117 kilometers (4 hours driving). On the way stops at Ledalero - a major Catholic Seminary - to visit the Blikon Blewut Museum with its various collections of local royal families' old portraits, antique hand woven clothes, fossils of stegedont (=giant elephant), etc. (if the museum had closed as it does sometime, we will visit it the next day on the way back from Kelimutu), and at Jopu traditional village to see tall thatch roofing house of Lio tribe and their typical hand woven ikat textiles. Opportunity for snap-shop along the journey will follow with the local happenings. Late afternoon arrive at Detusoko, check in at St. Franciscan Guest House. If there’s still time allows we drive down to hot spring. Dinner and stay overnight at St. Franciscan Guest House – beautiful setting, clean and very quiet. Day 2: DETUSOKO - KELIMUTU - MAUMERE (B/ L/ D). At 04:15 drive and hike up to volcano Kelimutu. On the way visit Nduaria - a beautiful setting road side fruit and vegetables market. Continue to Kelimutu to explore the inexplicably three colored crater lakes (Brown, Turquoise and Black). After exploring the lakes we hike and driving down to parking area. From here we trekking down through trail while watching birds and listening to the natural voices. Back to vehicle driving down till former Forestry Conservation Post then follow another trekking trail passing through beautiful villages and waterfalls till we reach the Trans Flores High way and return to Maumere. Lunch serves at Laris – a sea view restaurant in Paga. Before Maumere we drive off road to Sikka weaving village to see typical hand woven ikats from Sikka. First we enter this village there usually nobody hanging around, but once one sees we are coming, she/ he will tell all the weavers by yelling: “tourist, tourist….”, all of a sudden all weavers will swarm over us with their beautiful ikats on the shoulder as a way to attract visitors’ eyes – of course they expect visitor to buy one. Next we go and see an Old Portuguese style Catholic Church, built since the Portuguese were still on Flores. Return to the high way and onto Maumere and further onto Wuring fishing village on the north west to see Buginese stilt houses stretch down the lowest tide line – it’s a beautiful village filled with hundreds of Pinishi boats and catamarans. Continue to hotel for dinner and stay overnight at Sea World Club Cottages or at Wailiti Beach Resort. Day 3: MAUMERE - DEPARTURE (B/ -/ -). Early in the morning excursion to Watublapi village to see traditional dance performance and manual weaving demonstration. The whole performance begins with customary greetings then followed by performance of music, dance and folksongs then opportunity to observe the whole process of hand weaving textiles. From Watublapi we drive directly to Frans Seda airport for your flight to next destination. Our service ends!